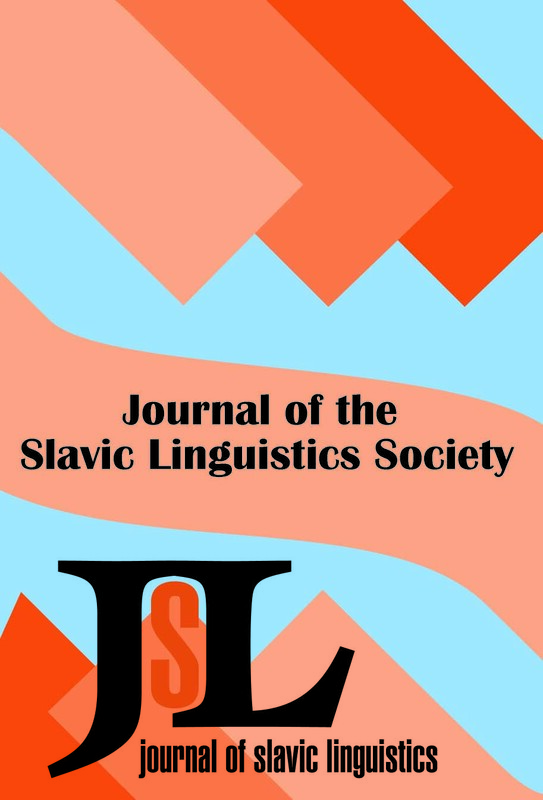 Abstract:This paper considers the relevance of the Vendlerian lexical aspectual classification of verbs in Russian. We focus on the lexical classes of accomplishments and activities and argue that the classification of verbs into activities and accomplishments cuts across the classification into perfective and imperfective verbs. Accomplishments display incremental structure and occur as perfectives and imperfectives. Activities do not display incremental structure and also occur in the perfective and imperfective aspect. The distinction between activities and accomplishments is expressed through their interactions with what we call incremental modifiers: modifiers which are sensitive to the incremental structure of the verb meaning. These modifiers include postepenno ‘gradually’, and ‘X by X’ modifiers such as stranica za stranicej ‘page by page’ and ètaž za ètažom ‘floor by floor’. Imperfective activities do not occur with either postepenno or the ‘X by X’ modifiers, and neither do the verb forms which Padučeva 1996 calls “delimited activities” (delimitative). Accomplishments in both the imperfective and the perfective aspects occur with postepenno and the ‘X by X’ modifiers (although some Russian speakers find some examples of perfective accomplishments with ‘X by X’ modifiers unnatural owing to what we consider to be pragmatic reasons). We show that the behavior of these modifiers generally follows if we assign accomplishments the incremental structure posited in Rothstein 2004 and treat the modifiers as directly modifying the incremental structure. Abstract:The aim of this paper is to examine features resulting from language contact under conditions of language shift in a variety of Serbian spoken in a migrant community in Melbourne, Australia. Three categories of change are proposed: (i) change that makes Serbian more similar to English without simplifying it, exemplified by the resetting of the pro-drop parameter; (ii) change that simplifies the structures of Serbian without making them more similar to English, exemplified by leveling within the verbal inflectional paradigm and dropping of the 3sg auxiliary clitic je; and (iii) change that both simplifies the structures of Serbian and makes them more like English, exemplified by leveling within the nominal inflectional paradigm, use of full pronominal forms following the verb rather than clitic pronominal forms in second position, and placement of verbal auxiliary clitics and the reflexive clitic se. Abstract:This paper compares competing ways of understanding the fact that clitics but nothing else freely and necessarily intervene between the two verbal heads in Bulgarian compound tenses of the type [participle + (clitics +) auxiliary]. These involve a participle fronted for focus reasons. The problem is then how the clitics get in the middle. I argue that prosodic and morphological approaches are not adequate, nor is any PF-filtering necessitated. Instead, the complex head structure [[participle + clitics] + [auxiliary]] must be created syntactically, with the participle adjoining to the clitics before the resulting complex adjoins to the auxiliary. Abstract:This paper demonstrates that the Double Object Construction exists in Bulgarian, a fact that has so far escaped notice due to the disguise in which the construction appears. Bulgarian is a language that allows an indirect object to be optionally doubled by a dative clitic. I claim, however, that this optionality has formal consequences: ditransitives with dative clitic doubling are equivalent to Double Object Constructions (DOC), where the DP Goal is projected higher than the DP Theme. Variants without dative clitic doubling, on the other hand, are Prepositional Ditransitive Constructions (PDC), where the DP Theme is projected higher than the PP Goal. Although not evident from the surface word order and morphology in Bulgarian, the availability of these two distinct structures is confirmed through classic diagnostics such as binding, weak crossover, and scope. After attesting the DOC in Bulgarian, I offer an analysis in which the dative clitic is the morphological realization of an applicative head. I also draw parallels with Romance, suggesting that UG may be implicated in this type of doubling.